For indeed we have had the good news preached to us, just as they also; but the word they heard did not profit them, because it was not united by faith, in those who heard. Only believers can grow spiritually, for unbelievers are dead in trespasses and sins. Although we are commanded to grow there are certain hindrances. Trying to do good works in our own strength and living under legalism, (under law) rather than being led by the Spirit, prevents spiritual growth, and sadly this blocks our fellowship with the Father. Indeed such hindrances to spiritual growth are rooted in unbelief. We need to apply the biblical criteria for growth, which has nothing to do with self-effort. Growth is not dependent on how long we’ve been saved, nor is it connected with a religious lifestyle or good works, carried out in the flesh. Spiritual growth is not a matter of how much we pray or witness.. and a lifetime of learning scripture, will not cause us to mature in the faith, unless it is carried by grace, through faith..
You won’t grow because you sing in the choir, teach Sunday school or attend a seminary. Growth is only by grace and not by what we do. No believer will mature without knowledge of the Word, but biblical knowledge alone is not enough. The Word must be mixed with a right response to God, and a right response to God is trusting His Word – trusting it by faith. The book of Hebrews used Israel as an example for our learning. Israel had a knowledge of God’s word, but did not respond rightly to Him. They responded in unbelief, which caused them to remain spiritually immature, and rebellious. Christians likewise are reminded that spiritual maturity comes by faith, and not by what we do. This wrong response to God’s Word prevented Israel from entering God’s rest, and like them we are warned of the possibility that if we follow their example we too will come short of God’s rest. We discover that Israel heard the good news but did not adopt a right response to His word – by faith. We read : for unto us (Christians) was the gospel preached, as well as unto them (Israel), but the word preached did not profit them, as those that heard it did not mix what they heard with faith. Israel’s response to God’s word was unbelief, and so the good news they heard did not profit them, as it was not mixed with faith. Israel lost out at that time because of a wrong response to God’s word, They did not believe what God said so they did not mix their knowledge of His Word with faith. And this same warning, against a wrong response to God’s plain truth, is given to all of His children. We are to grow in grace. We are to grow spiritually in grace, which is achieved by believing what God has told us in His word. We are all warned not to develop a wrong response to God’s Word, which it rooted in unbelief. 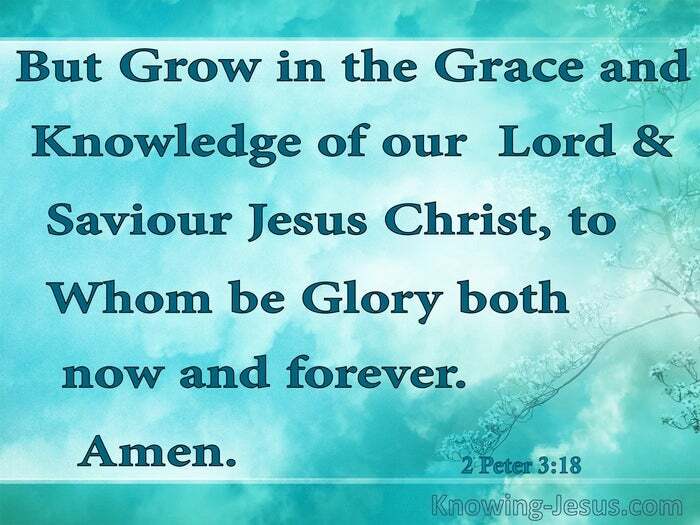 We are commanded to grow in grace and in a knowledge of the Lord Jesus. We are to spiritually mature, but growth will not take place unless we trust the word of God – and it is ALL by grace. When we were first saved, it was because we believed God’s word, by grace through faith. But too often we try to continue our Christian life by works through unbelief instead of by grace through faith. Let us look carefully at our own Christian walk, to ensure that we are not slipping into unbelief in our own, fleshly attempt to live a good Christian life!